His suggestion fills the room with tension. Lowering and retrieving the rosette can take many hours, but the water samples it retrieves from the ocean’s depths — as much as 4 kilometres down — hold the biggest potential for new discoveries. 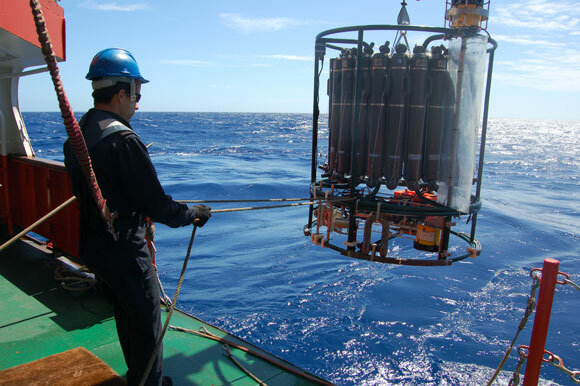 Sampling excursions in the Indian Ocean’s deep waters are relatively rare, making the samples particularly valuable. “Isn’t this a deep-sea campaign?” snaps Celia Marrasé, a plankton ecologist at the Institute of Marine Sciences in Barcelona. Marrasé studies how dissolved and particulate organic matter sequesters carbon in the sea: skipping the deepest waters would affect her results. After more heated discussion, Dachs agrees to consider saving a few minutes on each of the 12 remaining days at sea by cutting time for all the observations, not just those from the rosette. The disgruntled researchers scatter, but cannot go very far: their bunk rooms open directly onto the scientists’ lounge. In such a tight space, there is neither the room, the time nor the money to let differences escalate. “It’s very expensive to send people to these places and you want to get a lot of return,” says Albert Harrison, a retired psychologist from the University of California, Davis, who has studied the social factors that lead to success on space missions. For decades, NASA, the Russian Federal Space Agency and researchers in psychology and anthropology have examined how to achieve productivity in remote settings, gleaning lessons that are useful for any scientist who conducts fieldwork in close quarters. Astronauts, polar biologists, desert geologists and ocean chemists all face similar challenges in their working conditions: relative isolation; overexposure to their colleagues; pressure to accomplish a lot of work in a short time with limited technical resources; and few options for escaping to family or friends outside work. If managed poorly, such circumstances can degrade a team’s cohesion, health and productivity. Scientists’ experiences, and the work of psychologists such as Harrison, suggest that researchers designing remote expeditions need to cultivate a sense of mission to guard against tough conditions, plan ahead with suitable schedules and equipment, practise working in field conditions and, above all, exercise patience when colleagues, instruments and experiences don’t live up to their initial hopes. In the early years of human space flight, mission planners had huge expectations for how the astronauts would spend their precious days in space. “Historically there was a tendency to over-programme,” says Harrison. That was exacerbated by the enormous cost and limited flight time of each expedition. On a smaller scale, the same thing often happens in fieldwork on Earth. When Tim Wright, a geophysicist at the University of Leeds, UK, led his first field trip to the Afar region of Ethiopia, he had a long list of multidisciplinary observations that he hoped to make, from collecting rocks to mapping fault structures. “We go in with these incredibly detailed plans: day one, go here; day two, go here,” says Wright. By the second day, “it’s usually ripped up and used to start the fire, because things take way longer than you anticipate”. Trying too hard to achieve too much can harm the scientists and their data. Alberto Escribano, second in command on the Hespérides, is in the Spanish navy, and has first-hand experience of the consequences of teams pushing themselves too far. He explains that Spanish navy crews typically alternate 6-hour work and rest shifts on combat ships, but if they maintain this schedule for much longer than two weeks, the crew members become exhausted — and havoc can ensue. Sailors who are overtired don’t cope well with tasks that demand close attention, such as keeping the ship steady while instruments hang overboard. The same effect can wear down researchers, leading to squashed fingers, broken sampling bottles and fewer or lower-quality data. The solution for longer voyages, such as seven-month cruises on the Hespérides, is for each crew member to take shorter watches with longer recovery times. Conflicting research goals can overload an expedition’s agenda and put researchers under stress. The Hespérides expedition led by Dachs is just one leg of a Spanish National Research Council (CSIC) circumnavigation of the Indian Ocean that is trying to balance the research objectives of six disciplines, including biogeochemistry, microbiology and environmental chemistry. 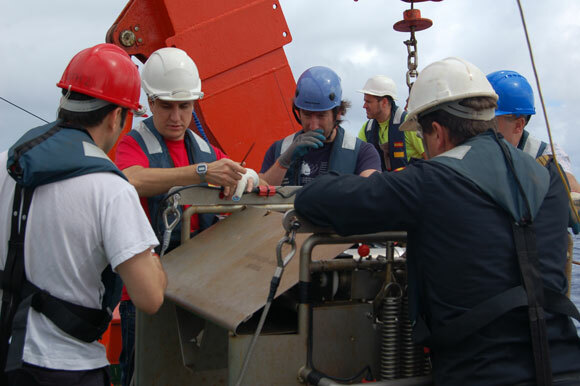 The ship has to be stationary for researchers to use some instruments, such as the sampling rosette, but has to be moving for others, such as a pollution-sensing torpedo. Still other observations can be done only one at a time, to prevent cables from getting tangled. The resulting Byzantine schedule has, at times, left some researchers on the Hespérides working around the clock, sleeping only in short stretches, and others keeping a more comfortable 8 a.m.–3 p.m. schedule. The success of an expedition can hinge on compatibility — or lack thereof — between team members, so it is important to choose companions carefully, if possible. Wright says that on his field trips in Afar, the most laid-back people cope best with the conditions, and he takes this into account when selecting graduate students and hiring new members of the team. He counsels postdocs and investigators to discuss such considerations before deciding which graduate students or colleagues to invite on their own expeditions. Researchers who aren’t at liberty to select their field companions should consider arranging a shorter, simpler ‘test’ trip ahead of time, so people can learn to work with each other before the big commitment. Gloria Leon, a psychologist at the University of Minnesota in Minneapolis, says that space agencies often test teams of astronauts for compatibility by taking them on short field excursions or even road trips, exposing them to the tight spaces, tough field conditions and even body odour of a real adventure. Escribano endorses this kind of advance testing. “If I had to screen people for this, I’d lock them in a room and shake it around for a while,” he says. He recommends watching for stress-induced irritability or self-imposed isolation, and offering team members extra attention to help them deal with the stress, if they need it (see ‘Tips for far-off fieldwork’). A few precautions will help to promote an efficient, productive and comfortable research expedition. Cultivate a higher sense of purpose — you’re learning how plankton trap carbon, not just filling dozens of bottles with sea water. Make your quarters habitable. People on different shifts shouldn’t have to share the same bunk. Test your equipment. The field is not a good place to learn how it works. Test your team. Get to know how they will respond to field conditions, and head off any problems that arise. Remember to rest your body. In the long run, your work will be better. Build downtime into the schedule; if delays don’t use it up, new opportunities will. For example, after the meltdown at the Fukushima Daiichi nuclear plant in Japan in March, the scientists on the Spanish research vessel BIO Hespérides began to take previously unplanned measurements of radiation levels. Promote open communication to let team members brainstorm or just blow off steam. L.L. Even if a research group doesn’t have the luxury of running a trial trip, members can still benefit from working together in advance and trying to sort out any interpersonal difficulties, says Leon. The sole female member of one group of polar explorers that Leon studied complained that the men in the team competed with each another and all vented to her, giving her a disproportionate and unexpected emotional burden. Had she been able to anticipate that dynamic, the explorer might have had a chance to address her companions’ behaviour beforehand and avoid undue strain during the trip. Focusing on a long-term career or scientific goal can help researchers to cope with the stress of fieldwork, says Leon. She has learnt that the people who succeed on expeditions to the poles — whether they are scientists, sports enthusiasts or explorers — are able to tolerate the conditions because they are trying to achieve something important to them, such as being the first people to ski to the North Pole. Similarly, scientists should keep in mind the scientific problems they will be able to solve, or the papers they will publish, when they’re staying up all night to monitor instruments or bathing from a bucket in the desert. Shrugging off the frustration is easier for old hands than for expedition novices such as Patricia Puerta, a marine-biology graduate student at the CSIC’s Mediterranean Institute for Advanced Studies in Majorca, Spain, who is staking her PhD on plankton data collected on the Hespérides. On Puerta’s first cruise, loose equipment on deck broke her incubation tanks during storms. “My stuff was cannon fodder,” she recalls, and she worried that she wasn’t making enough progress on her PhD. By the second leg, Puerta had found better ways of rigging her incubation tanks to save them from damage. She also learned the value of patience, she says. “Delays still bother me, but now I’m more accepting.” Puerta realized that not every sample was crucial. Part of becoming an accomplished fieldworker is learning to delegate responsibilities such as planning the logistics of an expedition, and to rely on experts to handle things that the researchers can’t do as effectively themselves, says Wright. In the Afar, that has meant trusting local scientists or technical staff to help install instruments, negotiate maintenance with Afaris and rent camels for transport. “We couldn’t do any of this without our local colleagues,” says Wright. “You can’t have your eye on all of the balls that are in the air.” For Puerta, that meant accepting practical assistance: when her fraction collector broke, preventing her from taking automatic water samples overnight, she didn’t, in this instance, have the technical skills to fix it, and had to trust that someone else on board did. “It can make people feel helpless,” says Escribano, who, it turned out, travels with a silver briefcase of electronics equipment and was able to diagnose and repair Puerta’s instrument. Seasoned field scientists must also learn to deal with extended stretches of discomfort and boredom. Breaking the routine on the ship can help to distract people from the discomforts, says Escribano. He has used costume contests and card games to entertain the research team. Others have different ways of dealing with the relentless presence of others, says Leon; she recalls a polar explorer who would “dig real deep in her sleeping bag at night to cover her head” to secure some respite from her companions. Technology can also mitigate the monotony of fieldwork. Satellites allow team members to ease homesickness by contacting family and friends by phone and through e-mail and social-networking sites, even if only for limited amounts of time. Communications technology can also facilitate scientific decision-making, says Dachs. “On a cruise, you have to react fast, and we use e-mail to consult colleagues on land when we have a problem or a question,” he says. From the Indian Ocean, he was able to talk to the other senior expedition planners at research institutes throughout Spain and work out which observations to trim. Not everybody was happy, but everybody was in the loop, and in the end they didn’t have to cut quite as many observations as Dachs had feared.